The city of Xi’an in China is rich in history, home to the terracotta warriors as well as providing the eastern end to the Silk Road. 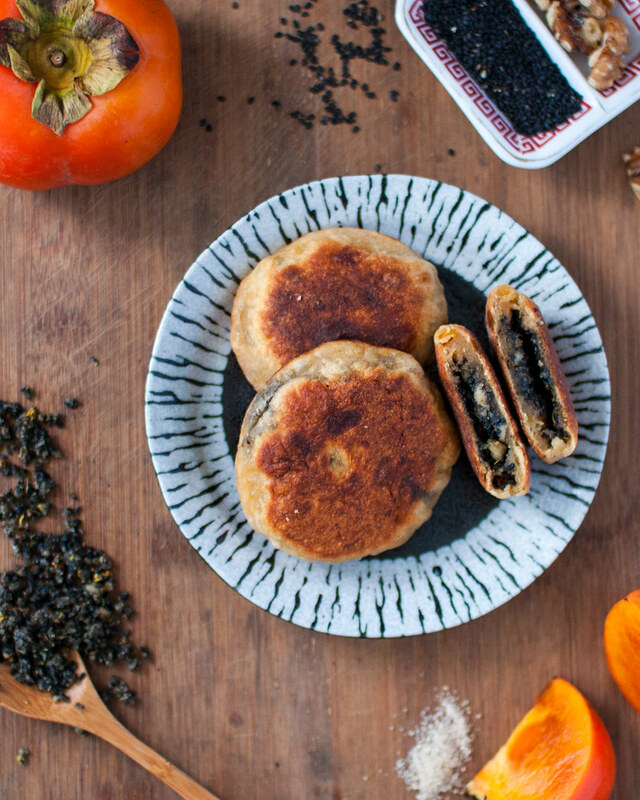 Along with the various dynastic influences in its 3200 year history, it’s cuisine has been influenced by the many minority groups residing in the region, like the Uyghur and Hui. 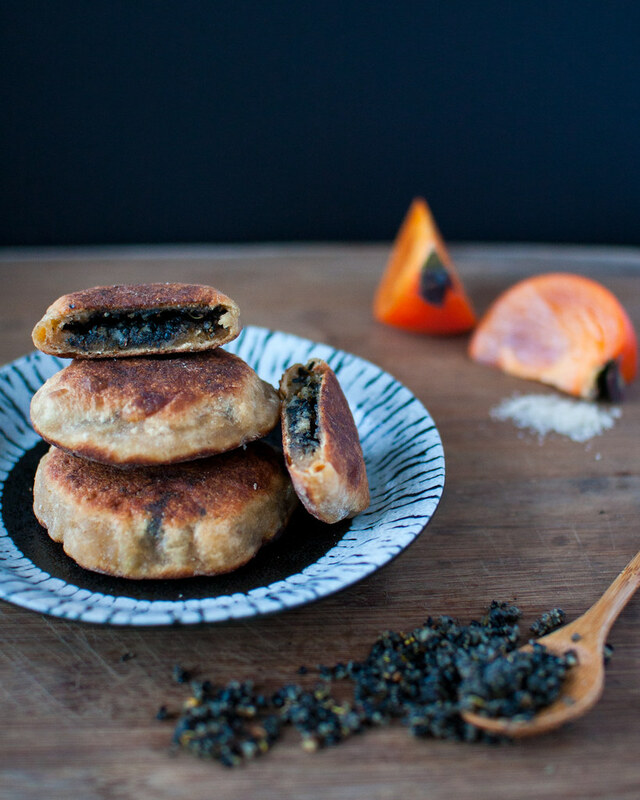 Fried Persimmon Cake is a popular muslim-influenced street snack in the region and this is my adaptation from this recipe. It combines some of the oldest flavours on the planet. Persimmon, described by the Greeks as “Fruit of the gods” has a long history in both the Middle East, Asia and eastern Europe. There are 2 main varieties, the astringent (Hachiya) and the non-astringent (Fuyu). The Fuyu is ripe to eat even when hard, and it’s profile is like a squat tomato. But the Hachiya has a better flavour (and a pointier end), but boy you have to wait when it’s almost liquid inside to eat or lest risk a furry mouth. 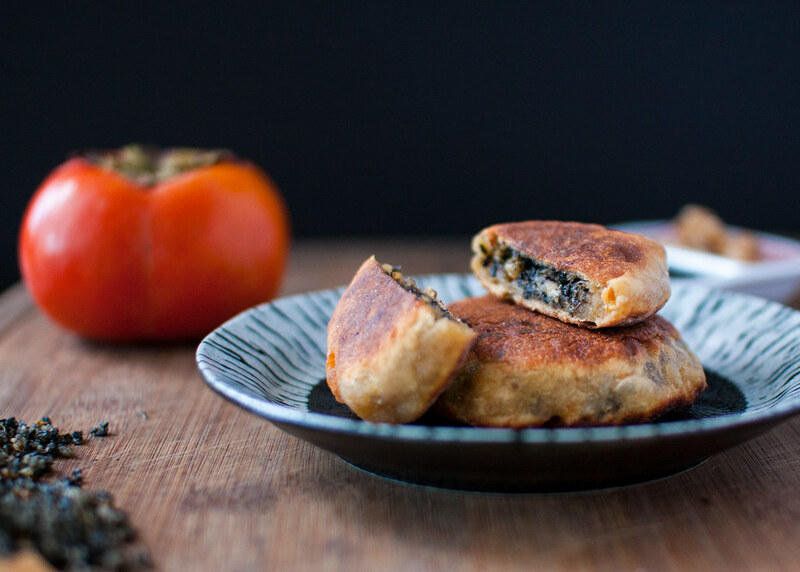 For this recipe, it’s best to go for the ripest Hachiya you can find. But unfortunately I’m finding that more and more stores are just selling the Fuyu and when you find the Hachiya, it’s almost double the price of the Fuyu. So if you have to compromise, then find the over-ripest Fuyu and then pulverise in a food processor. But be sure to remove the hard seeds though. 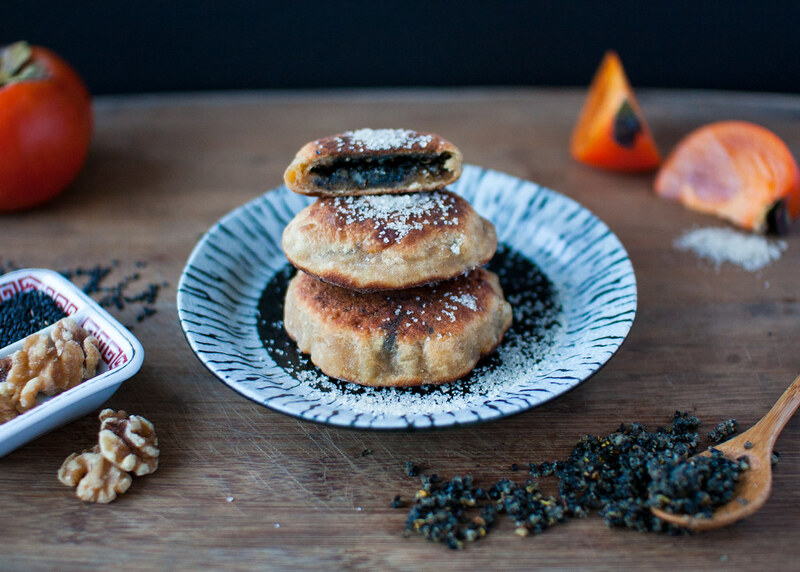 Black sesame and walnut combo is something that I remember vividly from childhood. It appears in a lot of Chinese sweets and traditional medicine. I’ve also added Osmanthus flowers (桂花) to the filling. You can find these dried in packets, usually in the tea or herb/traditional medicine part of your local Chinese supermarket. They have the most brilliant sweet fragrance and pair brilliantly with all the old school ingredients on show here. Peel and mash the persimmons. Mix in the flour little by little and knead until you get almost a bread or pasta dough consistency. Cover and let rest for a couple of hours. Toast sesame seeds and walnuts in a pan. Grind together in a mortar and pestle (you may use a food processor if you wish). Once done add the sesame seeds/walnuts to sugar, osmanthus flowers and melted butter. Mix well. Roll out the dough and cut into disc like portions. Flatten the discs and fill with 1-2 teaspoons of the filling. Squeeze the dough shut and shape into a patty. In a pan, heat oil on medium, enough to shallow fry the cakes. Fry the cakes until golden brown on both sides. (probably around 3-4min each side). Sprinkle a little raw sugar on top and enjoy!!! You can also freeze the raw cakes for later.